To Gatlinburg, TN on a whim! watching the "Big Blue Madness" (our big celebration for the upcoming University of Kentucky Wildcats basketball season) and about 10:00 p.m. we got to talking about "The Cheese Cupboard" in Gatlinburg, TN. If you haven't eaten there, they have the best sandwiches. To look at it you would think it is this tiny cheese shop...upstairs is a closely guarded secret...a tiny restaurant that is so intimate. Every September we go to Gatlinburg with a group of our friends and we rent a chalet for the weekend and we girls always stop in there on Saturdays and eat...it has become a tradition for over 25 years. That is where we have our yearly "therapy" session. We talk about anything and everything we want to talk about...mostly closely guarded secrets...what is said in The Cheese Cupboard, stays in The Cheese Cupboard. 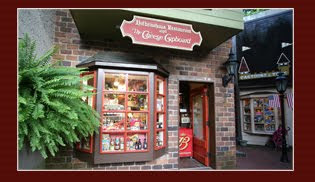 Anyway, at 10:00 p.m. we decide that we are gonna go eat at The Cheese Cupboard in Gatlinburg. We take off right then and there only throwing a few things together in the car. We arrive there at 3:00 a.m. in the morning and wonder where we are gonna stay for the rest of the night. We should have just stayed up and made a slumber party of it. We got lucky and found the last two rooms on the outskirts of town. October is the busiest month in Gatlinburg as the trees are turning and people just love the fall like atmosphere. Couldn't sleep very well that night so we got up around 7:30 a.m. and cleaned up and hit the pavement shopping. There are so many neat shops to be found. My favorite shops are located in what is called "The Village Shops." I bought some yummy smelling Crabtree & Evelyn Nantucket Briar body mist and wish I had gone ahead and took the plunge and bought the lotion. I cannot find it anywhere here in my town. I guess I will have to order it online. We also found this really cool shop called "Earthbound" that has lots of reggae, hippy things in it. 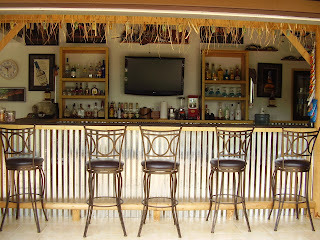 We bought this cool bamboo/bead room divider/curtain that has palm trees on it and it will look pretty neat in my tiki bar. They were playing some really great sounding reggae music so naturally we had to buy that cd also. Ended up buying a sweatshirt with a hood as it was raining that day also. We got home around 6:30 p.m. that night...what a fun weekend...we haven't done anything spontaenous like that in so long I cannot remember the last time we did it. If you haven't done anything spontaneous in a long time, I highly recommend it! Well, other than Saturday and Sunday, Friday is my third favorite day of the week! I get to wear blue jeans to work on Fridays and I always get excited when this day arrives. Tomorrow I am planning on going to my favorite craft show around these parts and it is usually a HUGE show! Can't wait to see and buy alot of pretties! I always get so inspired when I attend these shows. It has been a bunch of years since I've attended any craft show as I always went with my mom until she left this earth (just can't say the "d" word) in 2002. She would be proud of me for venturing out. I am going with my two sisters so that would make her really happy too! Win, win situation! Fall is my very favorite season of all. Not only is it the prettiest season (see the beautiful view I have in the fall?) to me with all the colorful leaves and cool air but it just makes me wanna nest. Yup...nest. It makes me feel warm and cozy all over and I get really motivated to paint coz Christmas is getting alot closer. I love giving up all the foods that I call "summer" foods and move on to the "fall/winter" foods, like soups. My second passion to painting would be reading and collecting recipes. I read them like I would a great novel. I also try different recipes as I'm constantly updating my recipe book that I'm working on to give away to my family and friends for Christmas. Below is my very favorite soup recipe that I get requests for all the time. STAY TUNED FOR MORE RECIPES AS DAYS PASS. Enjoy! Peel and dice potatoes, chop onion. Put potatoes and onions into stock pot or Dutch oven and cover with water (just up to the top of the potatoes. Cook on medium heat until tender (30-45 minutes). Remove from heat. DO NOT DRAIN! Cut cream cheese into chunks and stir gently into soup until melted. Stir in celery and mushroom soups, garlic salt and salt and pepper. Heat on low until ready to serve. Add Velveeta until melted. Top with chives and bacon bits. Real soon I will blog about my third passion...can you tell I'm just a passionate person? I LOVE life! Have a wonderful weekend! Welcome to Cyndimac's Nick Knacks. Cyndimac being me, and Nick because I LOVE anything with dear old St. Nick on it and all types of seasonal knickknacks. 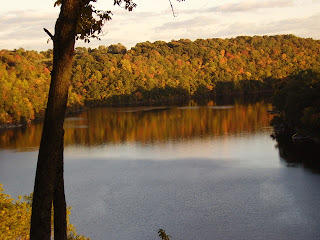 I live on a beautiful lake in Kentucky where I am totally at peace. I'm happiest at home. Unfortunately, I have to work outside the home and it keeps me from doing what I truly love and that is painting. Painting is my PASSION! My mind often drifts off dreaming about what I want to do next. I find myself jotting down lots of ideas daily. Now just if I had the time to do them all or even a little bit of them. Until I learn how to do all this high tech blogging you might find this place a mess...much like my craft room I'm sorry to say. You know a person is serious about crafting when their craft room looks like a "torned down nado" (what a friend of mine calls it), uh, tornado has gone right through it. Well, hope to contribute more at a later date...STAY TUNED!